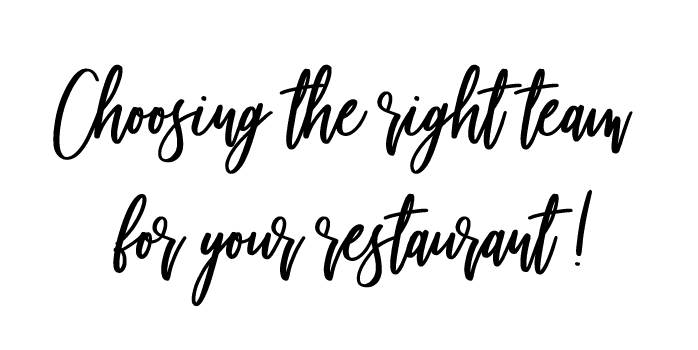 Running your own restaurant? Or opening a new restaurant? It takes a while to get it up and running; lots of late nights, stress and anxiety. So many hurdles to cross, so much paperwork to do. So many forms to fill in. Licenses for this and licenses for that, health inspectors, safety inspectors, food inspectors. Decorators and painters, cleaners and polishers! Bathrooms and kitchen to decorate; tiles and fittings to choose and source. A never-ending check list. And all the while money is flying out the window faster than the speed of light. You're probably worrying that it'll never get finished and the doors will never open but hey, you’ve put your heart and soul into this project so it must work, mustn’t it? And you’re so tired, so little sleep to keep you going, no proper meals to sustain you, no time, just no time. And then come the dreams in the snatches of sleep; an empty restaurant with no food and no customers………… But it will be alright on the night, won’t it?!! And what about staff? Who’s good? Who’s honest? Who’s reliable? Who can cook? Who can serve? By now you probably have a queue of wannabe waiters lining the pavement waiting for you to hire them. But how are you going to choose the right team? How will you know who’s good for you? Simply Service has a solution for you. We’ll help you select your dream team quickly and efficiently. 1. You send the online course URL link to the prospective applicant. If they don't go through the lessons, it shows their lack of seriousness about working with you. 2. The lessons show the applicant how to write a CV and prepare for an interview. This pre qualifies the applicants to ensure you only get the most appropriate CV's. 3. You receive relevant CV's and interview competent applicants. This saves you many hours of sifting through resumes, trying to decide who you should interview. 4. You start building your awesome team! We are offering you two free 15 minute, cell phone-friendly, video lessons to give to the queue of wannabe waiters; then you won’t have to waste your precious time sifting through badly written CV's and conducting time-consuming interviews. In the first free Simply Service lesson, with the assistance of cartoon characters and an easy to understand voice-over, we’ll explain to your wannabe waiters how to write a comprehensive CV. (With guidelines on what information to add and what trivia to leave out). There’s even a downloadable template so there should be no mistakes. What you’ll end up with are easy to read well-presented CV’s with contactable references. Saving you time and saving your sanity! In the second free Simply Service lesson we’ll prepare those wannabe waiters for a job interview so you can pick your team from the best of the selected candidates. Saving you time and saving your sanity! Let Simply Service sort out the wannabes from the can-do’s for you. How cool is that?! Get access here: https://simplygreatservice.com/course/how-to-apply-for-a-positon-as-a-waiter/ – it's free for now, so don't delay in using this helpful tool to build the perfect restaurant team!